LXPB15-SKJ | GearBags.com By Lightning X | GearBags for all industries. 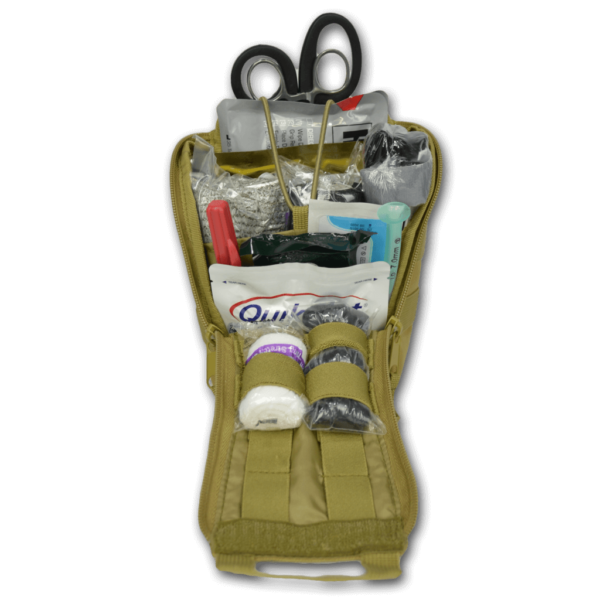 This emergency kit is packed with high quality survival gear and first aid supplies to treat a range of urgent wounds and injuries in the field. Our first aid kit includes emergency necessities to help treat those injuries like gauze, quick clotting hemostat pads and trauma shears. 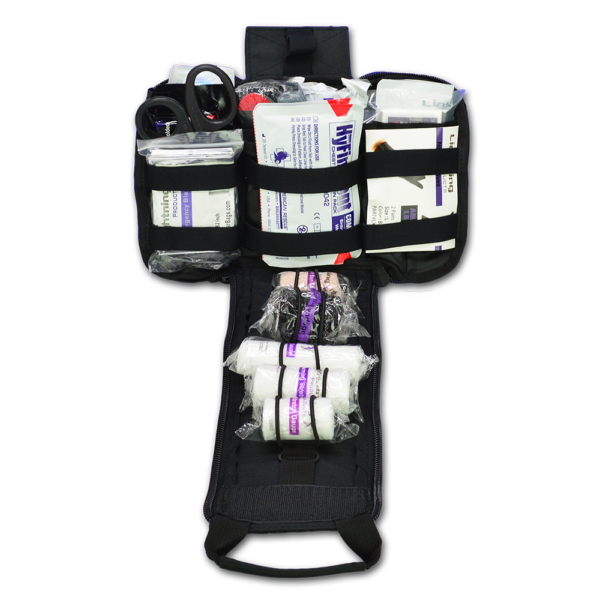 Our compact IFAK (individual first aid kit) is compatible with MOLLE (Modular Lightweight Load-carrying Equipment) systems and features thick double layer webbing bars in the back that can attach to any bag, backpack or vest with MOLLE platform. 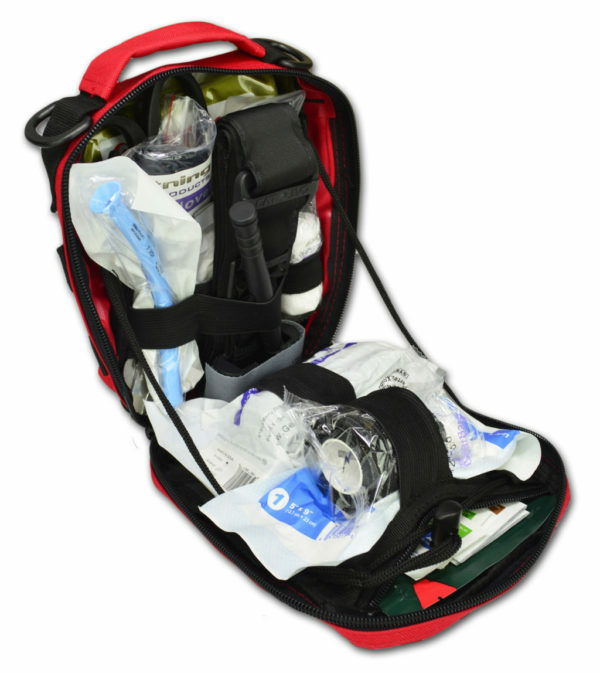 Our MOLLE pouch is ideal for police, military and tactical medics. It's also great for hikers, campers, survivalists and outdoorsmen. 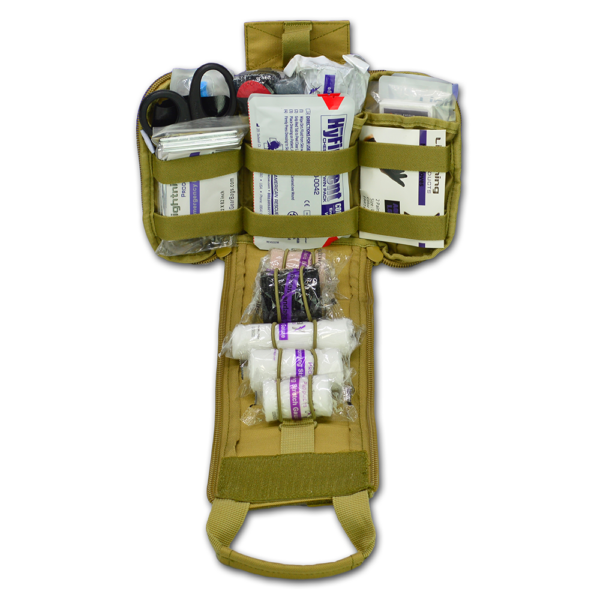 Our premium military first aid kit is constructed with high quality canvas material and comes in your choice of tan, black or red. The front of the MOLLE pouch features a strong series of webbing loops, hook and loop patch for name or morale patches, and elastic cording with a drawstring clasp. Inside the IFAK kit, we've designed the pouch to feature 8 elastic storage loops, a mesh pocket and a fully enclosed zippered pocket. LXPB15 IFAK Pouch, 5″ x 9″ ABD Pad, 3″x3″ Gauze Pad (2 packs of 2 pads), 4″ x 4″ Quick Clotting Hemostat Gauze Pad (brand varies), 2″ x 4.5yd Rolled Gauze, 7.5″ Trauma Shears, CPR Mask, Gen II R.A.T.S. Tourniquet, Israeli Pressure Bandage (4″), Black Nitrile Gloves (2 pairs), Alcohol Swabs (4), Iodine Wipes (4), 2″ x 4.5yd Black Self-Adherent Gauze Roll, Z-Folded Compressed Krinkle Gauze (vacuum packed), NPA Nasal Airway (28FR), Triangle Bandage (non-woven) with Safety Pins. The LXPB15 from Lightning X Products is a MOLLE accessory pouch designed for use as an IFAK (Individual First Aid Kit) or similar application. It features thick double layer webbing bars in the rear that can attach to any other bag, backpack or vest with MOLLE platform. The front features a series of webbing loops as well as a hook and loop patch for a name plate or morale patch as well as elastic cording with a drawstring clasp. The interior features 8 elastic storage loops, a mesh pocket and a fully enclosed zippered pocket – plus a grommet for drainage. The interior also includes a drawstring cording platform designed to hold the pouch at a 90 degree angle when in the open position – which aides in one handed use as well as keeping supplies secure. The top of the pouch is complete with a padded handle and two D-ring accessory loops. THE BAG: The LXPB15 from Lightning X Products is a MOLLE accessory pouch designed for use as an IFAK (Individual First Aid Kit) or similar application. It features thick double layer webbing bars in the rear that can attach to any other bag, backpack or vest with MOLLE platform. The front features a series of webbing loops as well as a hook and loop patch for a name plate or morale patch as well as elastic cording with a drawstring clasp. The interior features 8 elastic storage loops, a mesh pocket and a fully enclosed zippered pocket – plus a grommet for drainage. 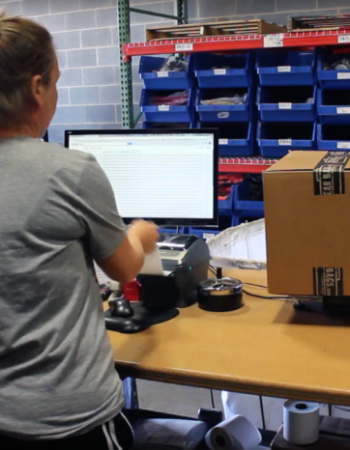 The interior also includes a drawstring cording platform designed to hold the pouch at a 90 degree angle when in the open position – which aides in one handed use as well as keeping supplies secure. 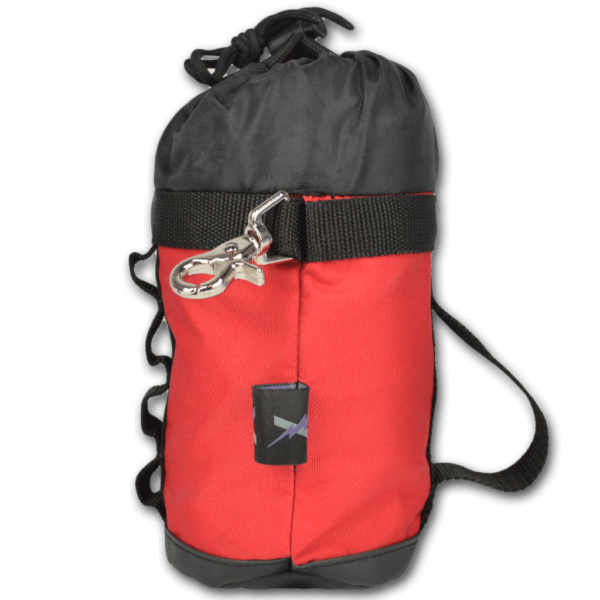 The top of the pouch is complete with a padded handle and two D-ring accessory loops. 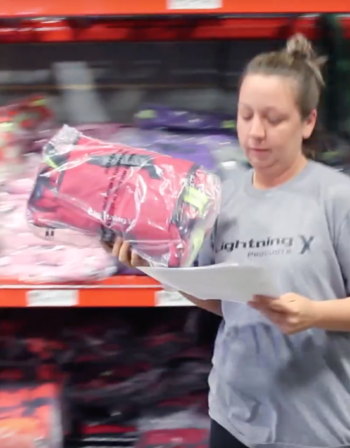 Includes a limited lifetime warranty from Lightning X Products. Hi Jim Bob, to answer your question: YES! The colors of our MOLLE pouches do match the color and fabric of the LXMB45 tactical trauma backpacks. Those backpacks now have laser cut MOLLE loops so that it's easier to attach your PB15 or any other MOLLE pouch or attachment.